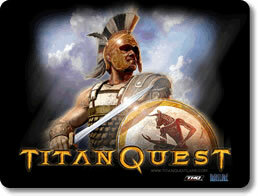 Titan Quest Game Review - Download and Play Free Version! The Titans Have Escaped and it's up to You to Stop Them! The ancient Titans have escaped from their prison and are wreaking havoc on the world! Quest through ancient Greece and Egypt to discover the secrets needed to imprison the Titans once again. Fans of Diablo will enjoy the similar gameplay set in a gorgeous ancient world. Journey to the Parthenon, the maze at Knossos, the Great Pyramids and much more by yourself or with friends. In this action role-playing game, you get to play a little before choosing your hero's class. Complete quests and destroy enemies with weapons like bows, daggers, clubs and magical weapons and create two weapon sets that can easily be switched during battle. When killed, enemies only drop items they were using, so it pays to battle more powerful enemies! Earn experience points by killing enemies, then use the points to upgrade your maximum health and energy, dexterity, strength or intelligence skills. Each weapon has different skill requirements. You'll also earn points to use in the eight masteries such as storm and warfare. At level eight, you'll have learned two masteries and these will combine to determine your class. Once you beat the game, you can play it again with the same hero but much tougher enemies. Play multiplayer games online with up to six friends and create your own levels to challenge your friends with online. This game is replayable because there are 36 possible classes so you can create an entirely different character each time you play. The abilities to choose your class after you've played the game for awhile and select which masteries to combine sets this role-playing game apart from others in the genre. The beautiful scenery complete with day and night cycles, realistic physics, fluttering butterflies and much more make this game convincing and memorable. 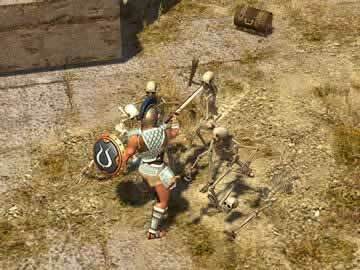 Use your skills to re-imprison the Titans now in Titan Quest! Titan Quest is an action RPG that is very similar to the Diablo series with plenty of monster slashing and dungeons to explore. It is nice to see a slightly different story with a mythological twist that will have you exploring the ancient world including journeying to the Parthenon, Great Pyramids, Hanging Gardens of Babylon, The Great Wall and other legendary locations. The rather lengthy single-player campaign, which can take up to 40 hours to complete, will let you face off against all kinds of monsters, such as satyrs, centaurs, harpies, gorgons, and cyclopes, as you work to build up your character. The character customization in Titan Quest is probably one of its most appealing features since it handles things slightly differently than other RPGs. At the start there are very few character options other than some cosmetic features, but once you gain a level you can choose to learn a mastery in one of the many talents available including: warfare, defense, hunting, rogue, earth, storm, nature, and spirit. Once you choose a mastery, with each level you then gain both attribute points, to spend on things like strength, intelligence, and dexterity, and skill points, which unlock further talents within your mastery, such as trap making for hunting or elemental spells for earth. What makes it even more interesting is that a few levels later you can add a second mastery, which lets you further diversify your character and make him more unique. This feature of the gameplay is great since it negates the problem some other RPGs have where you pick a class and build a character only to find that you don't actually enjoy their associated skills or play style. You can even pay non-player-controlled characters to reallocate your skill points if you want to change things later which lets you truly find your own niche. Add into this the fact that Titan Quest has a pretty spectacular multiplayer co-op system which allows up to 6 players to play at the same time and some pretty powerful toolsets that allow you to create your own maps and quests and it is pretty hard to find a reason not to try this title out. The only minor issue which arose while playing is that the inventory system can get a little clunky since it doesn't optimize space when picking up items so you may have to move items around in the inventory grid so that you can grab more items before heading back to town to find a vendor. This doesn't really impede the gameplay all that much and it is nice that you can create a portal back to town at pretty much anytime without having to find any special scroll or item if your inventory does fill up. With its unique character customization and addictive hack-and-slash action, Titan Quest is a great title to sink your teeth into and its lengthy campaign and player created content means you'll find plenty of gameplay hours as well. 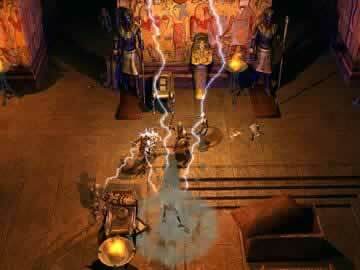 Watch a few scenes from the adventures in Titan Quest.